This is my first post. Wohoo, and welcome to the world. I’m going to be documenting my Spain trip here for a while, so expect stories and pictures from that. I’m sorry to not have done this when I was on the trip. Technology has been arguing with me lately. For those who don’t know, I took Spanish IV and Spanish Conversation the first half of this summer. And as part of that, I got to spend 3 weeks in Spain! It was a really fun time, and I will go back some day… Eventually. Anyways, this is the first part of the trip. This is me getting ready to pack before the trip. Mu, one of our cats who always gets in the middle of everything, wanted to come along. 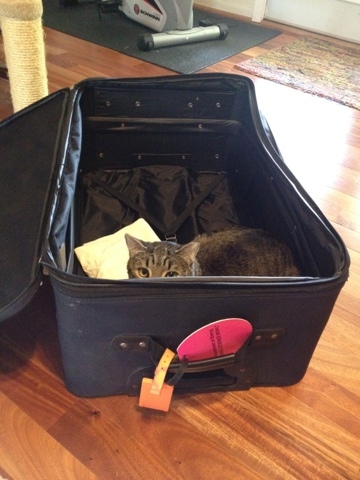 Sorry little guy, the hotels don’t allow pets. This is my first view of Spain. The inside of the airport, which was actually quite an interesting airport. All glass and stuff, very clean. Even the walkway off the plane was permanent, enclosed, and climate controlled. It was very nice, and had a much more modern feel to it than the airports here. Airport security getting out was very relaxed. 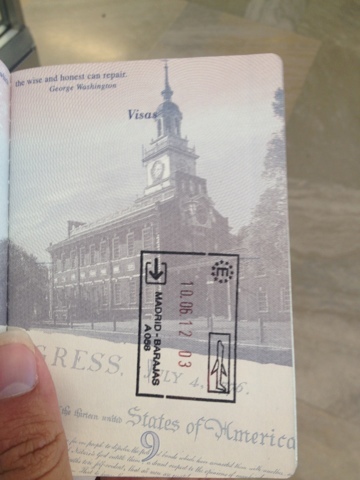 We went through one line and got our passports stamped, the guy didn’t even ask what we were there for or for how long. This is the visa in my passport for arrival. 10 June, 2012. They do their dates that way there, DD/MM/YY. I personally think it makes a lot more sense. I might write a whole post on that later. Here’s where we stopped for our snack/lunch on the first day. Yes, they have McDonald’s in Spain. 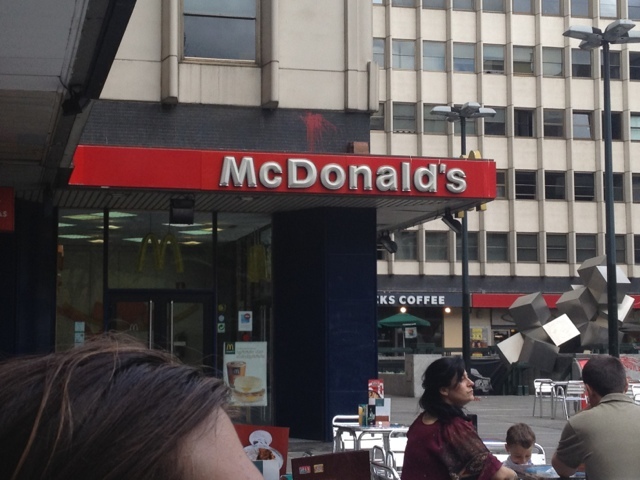 According to our guides, McDonald’s and Starbucks are the two fastest growing businesses in Spain. Which is totally against the local culture, and worries many Spaniards. They are afraid that they are losing their identity, and becoming more globalized, more like America. Plaza De Toros. Plaza of the Bulls. Bull fighting is a national sport in Spain, despite being incredibly controversial. 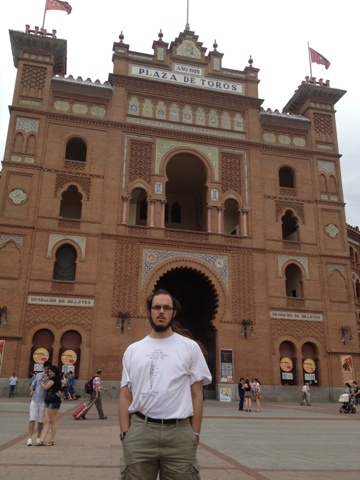 And no, I didn’t go to see any bull fights while I was there, although that was simply because there weren’t any going on at times that we didn’t have scheduled, required activities. Origen De Las Carreteras Radiales. Literally, origin of the radial roads. Kilometer 0. 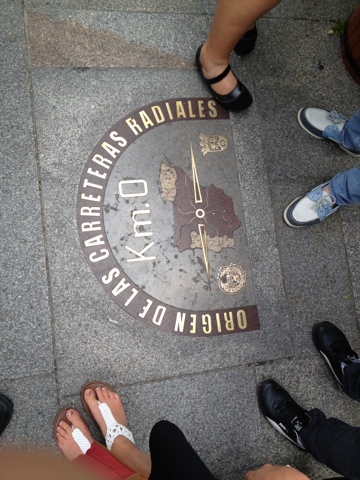 In ancient times, this was considered the center of Spain. All of the old roads extended from this point, in a starfish-like configuration. It’s now in the middle of Madrid, and many of the old roads are gone, in favor of a new more grid-like system that’s a lot more efficient. These are street statues. That flame is real. And so are the guys. They dress up really really convincingly and will stand on a street corner for an hour barely moving. There’s a little metal rat that is a statue, and though you can’t see it, there’s a can for people to throw money in in front of him. It’s their living. 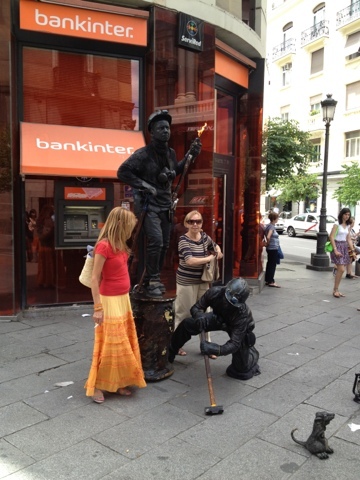 I saw these same performers at least four or five times during my week in Madrid. There were about a hundred other performers too, and I’ll put up pictures of some those in a later post. So, after two weeks of very intense classes here, we met up at the airport in Austin on a Saturday, and had a short flight to Dallas. 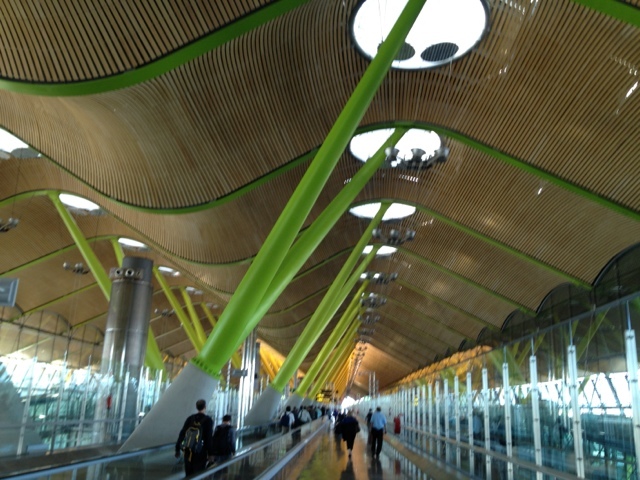 Then we had a 10 hour, overnight flight to Madrid. I can’t really sleep if I’m not on my side, so I got practically no sleep while on the plane. I could also write a whole post on people who lean their seats back for 10 hours, but I’ll just say here that I’m 6″1′, and it’s very painful for me to be that cramped. The very first thing we did was meet Niko, our CIS leader, who made sure we got where we were supposed to be for the entire trip, and Natalia, who was one of our guides in Madrid. Then, we got on a bus and they showed us several of the more important buildings and things around the city. Natalia conducted that tour, in Spanish. I don’t remember hardly any of it, but I know I fell asleep at least once and that I wasn’t the only one. She talked faster than any of our other guides, and was very hard to understand. After an hour or two of that, we were finally able to check into our hotel, where I was in a room with Ethan and Daniel. Later, there was a welcome dinner. Sean, another guide of Madrid, lead us on a two hour walking tour of the city before taking us to the dinner. I misunderstood and thought we were only going to the dinner and needed to dress up for it, so I wore my dress clothes and shoes. My feet were hurting long before we were done with that walking tour. Dinner really wasn’t all that great, the restaurant was much more about ambiance than quality. All of the food was served on fancy plates, and the napkins were all folded nicely and standing up. I’m willing to bet they spent more time on the napkins and arranging the food on the plate than they did actually making the food. Finally, that was all over by about 10 or 11 Spain time, so I had been up for at least 30 hours straight. I fell asleep immediately upon returning to the hotel. It wasn’t the best welcome to Spain that you could have, but it threw us right into the culture, and got us on the schedule. I think that when I go again, I’ll get in in the evening, go eat, and then crash, and worry about the touring later.